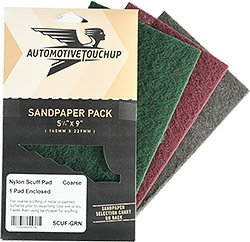 Grey scuff pads are fine grade and make lighter scratches which you can either paint directly over. For bare plastic you can scuff the plastic part with a grey scuff pad, clean, and then apply adhesion promoter before painting. Red scuff pads are medium grade and slightly more coarse. It is recommended to prime over the scuff marks left by the red scuff pad. Green are heavy duty coarse and seldom used.